Precipitation of calcium carbonate (lime) is a common clogging problem in microirrigation systems. Water with a pH of 7.5 or higher and a bicarbonate level of at least 2 meq/l (120 ppm) is susceptible to calcium carbonate precipitation if comparable levels of calcium are present naturally in the system or if a compound that contains calcium is injected into the system. The degree to which calcium carbonate occurs in water at atmospheric pressure depends on the pH and temperature of the water. At pH values of less than about 6, mostly dissolved carbon dioxide and a small amount of carbonic acid exist in water. At pH values of between about 6.5 and 10, bicarbonate is dominant. At pH values greater than about 10.5, the carbonate ion dominates. The causes of precipitation include the following. For groundwater, pumping reduces the pressure of the water as it flows into the well. This reduction releases dissolved carbon dioxide gas, causing the pH of the groundwater to increase, and that in turn can cause calcium carbonate precipitation. Evaporation increases the concentration of chemicals that are dissolved in the water that remains in the emitter. Because of its low solubility in water, calcium carbonate readily precipitates during evaporation. The degree of solubility of calcium carbonate falls as the water temperature rises. The temperature of water in surface microirrigation systems can increase as the water flows down the laterals. The injection of certain chemicals such as aqua ammonia and bleach or the injection of calcium-containing fertilizers or materials such as gypsum can cause precipitation. Lowering the water's pH dissolves any existing precipitates of calcium carbonate and prevents the formation of additional carbonate salts. The usual treatment for calcium carbonate precipitation is to inject acid to acidify the water, lowering the pH to 7 or less. Common acids used for this purpose include sulfuric acid, muriatic acid, and hydrochloric acid. Other acids such as citric acid and nitric acid can be used, but they are more expensive. An acid-fertilizer compound such as urea-sulfuric acid is safer to use than a straight acid. However, the continuous injection of nitrogen-containing acid products may cause problems over the course of a season for crops that are sensitive to excessive nitrogen applications, such as apples and wine grapes. Researchers have evaluated other compounds such as a phosphonate and phosphonic acid materials and have found them to be effective in preventing calcium carbonate precipitation. The recommended treatments for preventing clogging are as follows. Inject acid continuously to keep the water pH between 5 and 7. Inject acid intermittently to keep the water pH below 4 for at least 30 to 60 minutes. The frequency of injection depends on the rate at which carbonate precipitation occurs. When using pressure-compensating emitters, check with the manufacturer before you lower the pH to 4 or less. Brass and any other non-stainless metal fittings can become pitted. The amount of acid needed to lower the pH to the desired level depends on the alkalinity of the water and the target pH. Two approaches can be used to determine the amount of acid needed. Develop a titration curve that shows the amount of acid needed to lower the pH of the water to a desired value for a particular irrigation water. This is usually done by a laboratory and requires that you provide samples of the water and the acid. The behavior of the titration depends on the alkalinity of the irrigation water so the titration curve may vary from one water source to the next. Figure 8 shows a titration curve using a urea-sulfuric acid solution containing 49 percent sulfuric acid. Use a trial-and-error approach by adding acid to the water in increments and measuring the pH, repeating until you reach the desired pH level. Litmus paper, colormetric test kits for aquariums and swimming pools, and portable pH meters can be used to determine the water’s pH. Numerous sources sell pocket pH meters; they require periodic calibration using standard solutions that can also be purchased. Figure 8. Titration curve for urea sulfuric acid with 49% sulfuric acid. 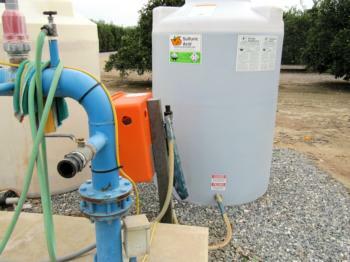 The acre-feet of water can be determined by the formula Q × T × 60 ÷ 326,000, where T is the irrigation set time in hours. Monitor the water's pH during the injection process to ensure that it does not go much below 4. All waters are “buffered” differently by the salts they contain; one water may require 10 gph while another will require only 2 gph. Calculate the injection rate needed to lower the pH to 4 using a urea-sulfuric acid (49%). The figure above is the titration curve. The system flow rate is 1,000 gallons per minute. Step 1. 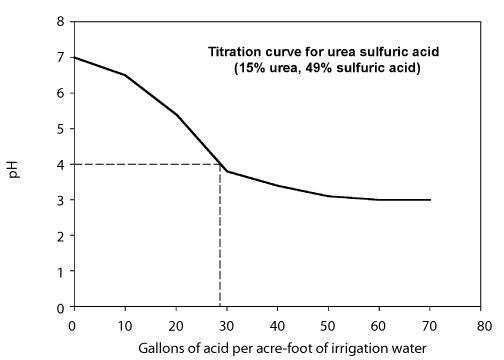 From the titration curve, note that 26 gallons of urea-sulfuric acid per acre-foot of water are needed to lower the pH to 4. Do not directly mix acid and chlorine. This will cause poisonous chlorine gas to form. Do not add water to acid. Instead, always add acid to water. Barnes, D., and F. Wilson. 1983. Chemistry and unit operations in water treatment. London and New York: Applied Science Publishers. Nordell, E. 1961. Water treatment for industrial and other uses. New York: Reinhold.